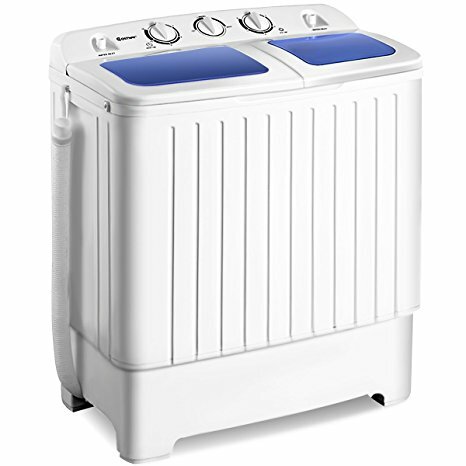 We have a small Gaintex Portable Washing Machine that we bought almost a year ago. It has served us well and we usually do one load of laundry a day to keep on top of our laundry. Since I am working during the mornings, I usually wash my work clothes when I get home, put them in the spinner to dry mostly out, and then hang them to dry the rest of the way. Its worked well, but I noticed something. Our water has been really dark after washing recently. At first I thought it was simply because I’m working outside and my clothes are really dirty. But then I did a load of laundry today with none of my work clothes in it, and the water was again really dark. Its a dirty, disgusting shade of gray and does not make me feel confident that our clothes are getting washed well enough. To remedy that, I came up with a cleaning regiment that I think we will have to follow about once a month or so. First, fill the washer bin completely with fresh water and no clothes. Then add a small amount of bleach and a small amount of detergent. Run the load completely, all by itself. This seems to help clean out the mechanism that is hidden underneath the agitator as well as clean the sides of the basin really well. When it is done, drain it completely. The clean, soapy water will also rinse out the bathtub where we have ours sitting, making it easier to clean again in the future. After the basin is completely empty, add water, lots and lots of water. Fill it partially (it will suds up again), then drain. Keep doing this for a few cycles until there are as few suds as possible. Then fill the basin one more time, but this time add some Borax cleaner. 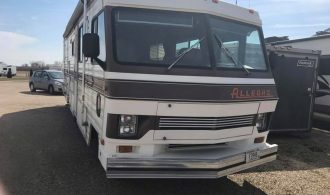 Many RVers already have it on hand since they use it in their black tank to keep it clean as well, and this does not require much. Fill the basin completely and run it one more time. When its done, drain it, rinse it if needed, but that should be it. Doing this once a month or so, depending on how many loads of laundry you do each month, should keep the system pretty clean and avoid the buildup of grime that occurs otherwise. I also plan to figure out how to take the lids off the basins and clean them as well. We have some natural cleaners that I hope I can spray in the cracks and corners, use a Q-tip to clean it out completely, and avoid any grime from accumulating there as well.